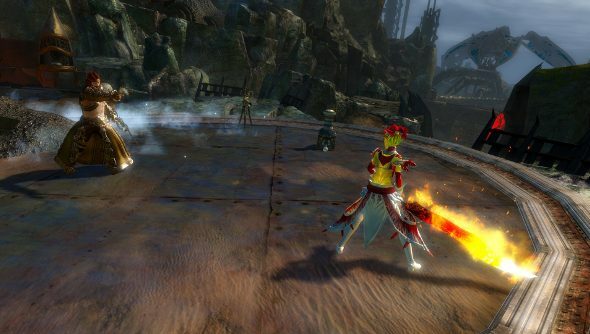 With ArenaNet’s ambitious Living World, one could forget that Guild Wars 2 has a competitive PvP bent. At Gamescom, the MMO developer is setting that right, putting on a live tournament and announcing a new update filled with a slew of PvP and WvW updates. ArenaNet has joined forces with Twitch for the International All-Stars Tournament at Gamescom. There will be live sessions at the Twitch booth, and for those not in Cologne, it will be streamed here. To coincide with the tournament, the developer announced the September 2014 update, which goes live on September 9th. The Living World is taking a short break while the devs focus on Guild Wars 2’s competitive elements, enhancing PvP and the large world versus world war zones. What’s in store for the game’s PvP is still a secret, but ArenaNet will be spilling the beans in the coming weeks.